As the old saying goes, “Nothing stays the same but change.” And for Twitter users, there are some rather interesting changes afoot. As the social media juggernaut continues to struggle with the question of what it wants to be when it grows up, Twitter has decided to make some long-overdue (in my opinion, anyway) refinements. Unfortunately, not all of these forthcoming changes are as momentous as you’d think…and they could even cause some downright gnarly issues (think the Law of Unintended Consequences). Long-winded folks (c’est moi, for example) everywhere are rejoicing…and so are spammers and creepers who like to harass others. Why? Because chief among Twitter’s newly announced changes is what will and won’t count against your 140-character limit. Previously, adding a photo, video, poll, or other rich media to your tweet meant Twitter would automatically assign that item a URL. Those URLs would then take up a portion of your allotted 140 characters, leaving you less room to work with. With the update, images and videos attached to tweets will no longer count against your allotted 140 characters. Don’t get too excited, though – regular links will continue to eat up your character counts the way Cookie Monster plows through a plate of Tollhouse’s finest. For example, if you upload an image to Imgur and then copy and paste the URL into your tweet, it will take up part of your available 140 characters. If you skip uploading the image to Imgur and instead just attach it to your tweet, the Twitter-generated URL won’t count against your limit. So there you have it – you now get an additional 23 characters to play with when tweeting about your brand (or alternately, raving over your favorite cat GIFs). Twitter is also giving you back some free characters in replies that include usernames. Now, usernames will no longer count against your 140 characters when you’re replying (usernames do still count against the limit in an original tweet). Why this is a good thing: if you’re in a three-, five-, or 10-way conversation, including everyone’s usernames – especially if they’re long names – can eat up characters quickly, leaving you with just a few to express your thoughts. Twitter has removed that barrier, with the goal of better facilitating conversation among multiple users. It could prove to be a very useful means of opening a dialogue with key audiences, enabling better overall engagement, and allowing easier demonstration of industry expertise and thought leadership. Why this is bad: because Twitter just made life easier for spammers, creepers, and malcontents. Remember that Law of Unintended Consequences I touched on earlier? Here’s where it comes into play. Twitter is now allowing you to include up to 50 (!) usernames in a given reply. That’s 50 chances for an malicious user to quickly spread bad vibes about you, your brand, or your company to customers, partners, media, or analysts. You could find yourself on the hook for damage control (but you’ve already got a crisis plan in place, right?) when you’re least expecting it. And finally, the ugly: things may soon get worse for individual users. Twitter already had a sketchy rep when it comes to dealing with harassment and spam. Now, one rogue user could potentially do serious damage to your brand with minimal effort, and spammers will be able to blast worthless tweets to more targets with just a few keystrokes. Hallelujah, we’re finally seeing the last of the dreaded “. @” at the start of tweets. Sometimes, a tweet just makes more sense when you start it off with a username, but it used to be that Twitter’s wonky functionality required you to add a period before the username for the tweet to be seen by all of your followers. Going forward, new tweets (i.e. – not replies) that start with a username no longer need the period at the beginning. Do remember that this is for new tweets only; replies to another user’s tweet will only be seen by those following both of you. So nice you gotta say it twice – Twitter will now permit you to retweet and quote your own tweets. Why does this matter? 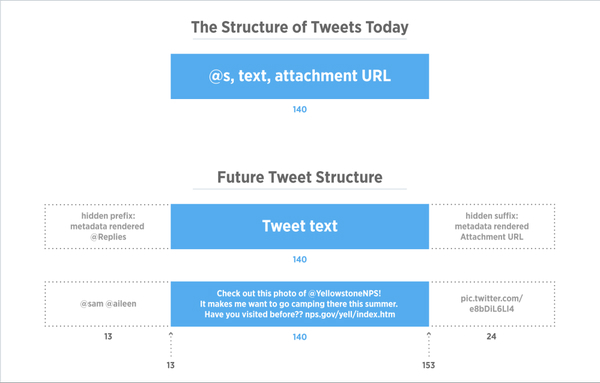 Because it gives you an additional opportunity to reshare a tweet you sent out previously, something that could be helpful for long-term campaigns, event promotions, and such. Or, if you made a typo or error but your tweet is already being linked to or retweeted, you can retweet your original tweet with a correction added in. Sure, it’s no edit button but it is still handy, no? There’s currently no hard date for Twitter rolling these new changes out, but they did promise they’ll be available over the coming months. These updates seem to be a step in (mostly) the right direction and Twitter has promised there are more in the works. Will these efforts help it to reinvent itself and set a course toward greater growth and profitability? Only time will tell. But as entrenched as Twitter has become in marketing, PR, and communications, I sure hope so.